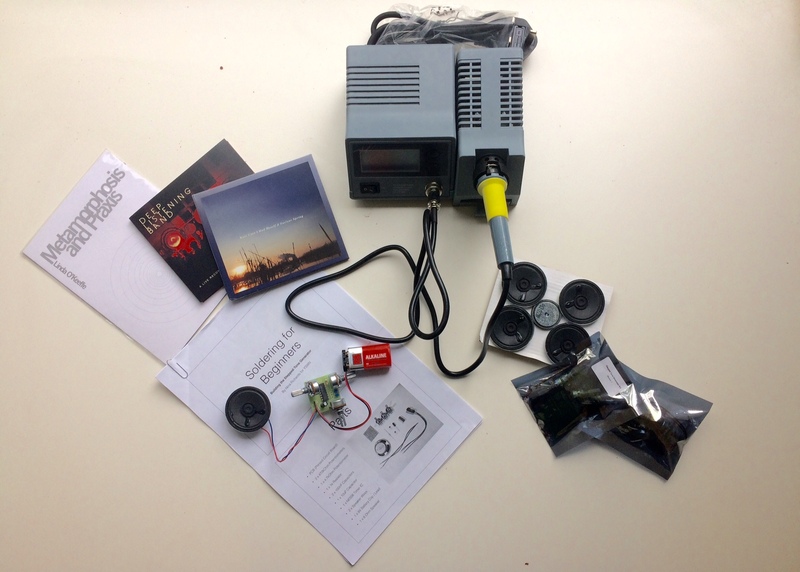 The contents of the box are designed to support both teachers and students to develop research projects and engage in the practical application of the skills and techniques covered in the video tutorials. Inside the box there are tools for soldering, instrument building and live coding. This is further complimented by CDs with the work of female composers and sound artists, written publications by women authors on sonic arts and music technology as well as practice-based techniques such as Deep Listening. Our aim, by making the work of women who have shaped and who continue to shape sound and music technology visible, is to encourage, support and activate young sound researchers in these areas of work. We strongly encourage teachers to develop research projects for students that connect the video tutorials to our interactive reading list space. For example, our history tutorial looks at women who worked with early technology to create new types of music. Consider developing a research project that asks students, in advance of building their instrument, to explore our reading list to discover other instances of women working in new ways with technology and to select media examples, either from our list or online. They can then link this to their instrument building activity. Also, the live coding environment SonicPi connects to a video tutorial. Students can explore again through the list, the evolution of coding and sound design. We will also provide links on the tutorial pages to a selection of artists and composers in those different areas for students to engage with.